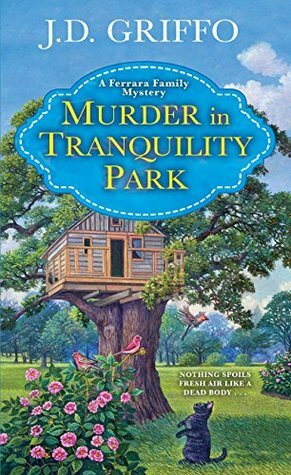 Murder in Tranquility Park by J.D. Griffo is the second book of the cozy Ferrara Family Mystery series. The twist to this cozy series is that you not only have one sleuth trying to solve the crime but several from a crazy Italian family full of laughs. Each book of the series has it’s own mystery to be solved so they can be understood as a standalone if choosing to do so. In the first book of the series, Murder on Memory Lake, readers were introduced to Alberta Scaglione, a sixty something widow who couldn’t believe the news she received that her aunt had left everything in her will to Alberta including her house on Memory Lake in Tranquility, New Jersey. Alberta was joined by her granddaughter, Jinx who is a reporter, and her sister Helen and sister in law Joyce who all get involved in the crime solving. Now in Murder in Tranquility Park Jinx and Alberta have decided to get healthy together and have taken up jogging in Tranquility Park only to yet again stumble upon a dead body. Despite the body being positioned under a treehouse looking to local law enforcement to be a simple accident Alberta immediately notices signs that point to murder so again the ladies find themselves tracking down a killer. The Ferrara Family Mystery series is definitely one for those that enjoy an over the top quirky and hilarious vibe to their mysteries. This group of ladies are extremely likable and haven’t failed yet to put a smile on my face while reading. I love that the author took the idea of a cozy ordinary person investigating and turned it into a family affair. Definitely will be on the look out for more from this series. Great review Carrie. I am so glad to see that this series quirkiness continues. I loved the whole big Italian family in the first book.